Chicken is probably the most popular meat in the world. Aside from being tasty, it is also extremely healthy, which is why we find it in various dishes. If you are a fan of both chicken and pasta, then we have a treat for you. 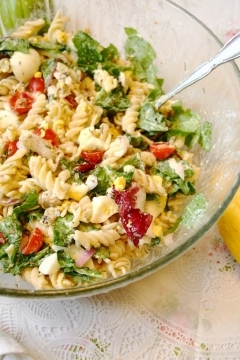 We have prepared a main dish as well as a pasta salad recipe. 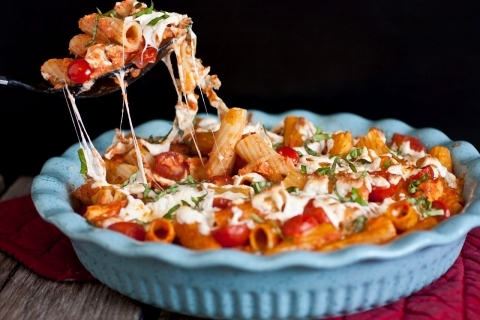 These are by far two of the best chicken pasta recipes. Our first recommendation is the [highlight color=”orange”]Grilled Chicken Caprese Pasta[/highlight], which is a classic Italian dish which will be loved even by the most pretentious people. This is one of the tastiest chicken pasta recipes and as you are about to see, it is very easy to prepare. Start by preheating the oven at 375 degrees. In the meantime start cooking the pasta al dente. In a separate saucepan, heat the tomato sauce and add the cream, the cheese, the garlic, the red pepper flakes and the salt and pepper. Stir frequently and cook until the cheese melts. Once the pasta is cooked, drain it and add the diced chicken, the grape tomatoes, half the mozzarella and some basil. When the sauce is done, add it to the mixture. Pour everything in a casserole and sprinkle with the remaining mozzarella. Cook it in the oven for about 20 minutes until the cheese is golden. Once it is done sprinkle with the remaining basil. This is a great main dish but if you are looking for a lighter summer dish we have the perfect solution for you. Try out this amazing [highlight color=”orange”]Chicken and Pasta summer salad[/highlight]. Cook the pasta according to the instructions on the package. Once it is ready, drain it and put it in a salad bowl. Mix it with the rest of the ingredients while it is still warm in order for it to wilt the lettuce. You can adjust the ingredients according to your personal taste. This is one of the easiest chicken pasta recipes as the ingredients are very flexible. Feel free to add some other ingredients that you think might work in the mix. PreviousPrevious post:7 Power Foods For The Abs DietNextNext post:Should Cancer Patients Follow a Macrobiotic Diet?